Note: this was originally intended to be posted last week, but there was a bit of an issue with images. All fixed now and everything should be getting back on schedule! Apologies for the low quality cell phone pics — I completely forgot to get photos until we were at the party. I had big party plans this weekend, then about mid-week started getting kicked in the head by social anxiety about said parties. So I cancelled out on one (I’ll get there someday, C!) but decided to just pop my head in at the other, largely because I’d offered to bring something and the hostess had requested a non-cake dessert: “You like to bake — bake something for dessert. But not cake. I’m baking a cake.” I like these kinds of parameters — guidelines are good. And also the cake was delicious. 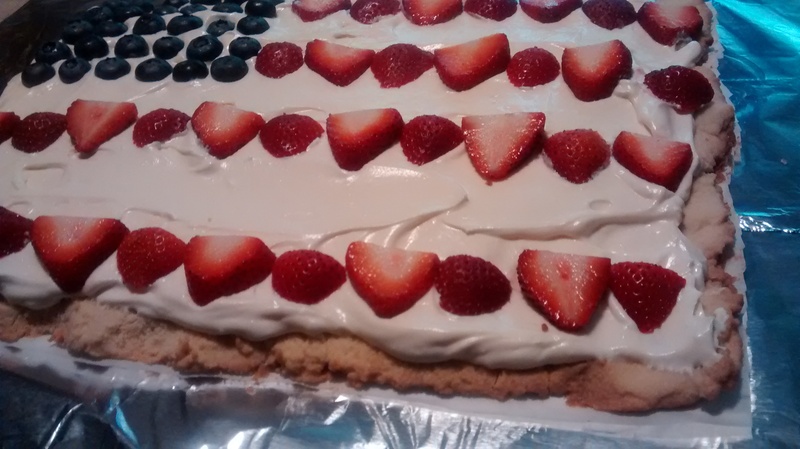 But ANYHOW, I decided I’d always wanted to make a flag tart thing, and this was the perfect opportunity. And I promised myself I could just drop off the tart and the kids and Kit and go home if I felt overwhelmed. I perused Pinterest for a shortbread crust, grabbed some cream cheese for cream cheese topping, and picked up blueberries and strawberries to top it all off. I had intended to bake the crust Friday night, but then I ate too much Chinese food and laid on the couch like a lump instead. And then I didn’t get up early enough to bake it before the town parade. So I was down to crunch time when we got home and I discovered I was out of regular flour. Um. Oops. 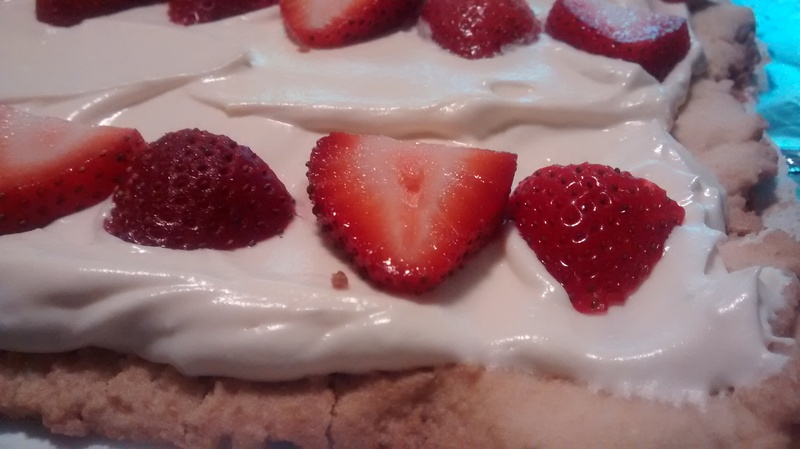 A gluten free shortbread crust topped by cream cheese frosting and fresh fruit. Combine butter, powdered sugar, and flours in mixer (will be slightly softer/doughier than shortbread typically is). Bake for 12-15 minutes, until just brown. Let crust cool for at least 1 hour (should be room temperature before adding topping). Whip cream until it is just beginning to peak. Add granulated sugar and vanilla. Continue to whip until stiff, being careful not to overwhip. Add cream cheese and whip until fully combined. Spread cream cheese topping on crust. Arrange blueberries and strawberries in flag pattern.